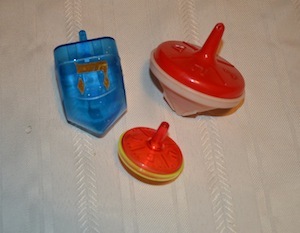 Dreidel is the most popular game for Chanukah. In Hanukkah: Eight Nights, Eight Lights, Malka Drucker writes that it evolved 2,000 years ago when the Chanukah story took place, at a time when Antiochus ruled over Judea in ancient Israel. “Groups of boys who had memorized the entire Torah would secretly study together until they heard the footsteps of the Syrian soldiers. Then they would quickly pull out spinning tops … and pretend to be playing games,” she writes. While playing cards and other games has been prohibited by the rabbis over the years, as the games were considered frivolous because they took away from Torah study, the custom continued. In medieval Germany, dice were used for the game, and they were inscribed with N, G, H and S. N stood for nichts, nothing; G stood for ganz, all; H was for halb, half; and S meant stell ein, put in. All players would hold an equal number of nuts, raisins or coins. Each player would put one in the middle, and the first player would spin the dice. Each letter stood for a move in the game – putting in or taking out nuts, raisins or coins, according to where the dice landed. The rabbis felt even more comfortable about the game when it was also realized that, when the Hebrew letters, which have numerical value, are added together, they total 358, the same number of letters as the word for Messiah. (Nun is 50, gimmel is three, hey is five and shin is 300.) The letters of the word Messiah or Mashiach in Hebrew are mem, which is 40, shin which is 300, yud which is 10 and chet which is eight. Since the Jews are still waiting for the Messiah, this would show the way for a miracle. Another mystical interpretation of the Hebrew letters is described by Philip Goodman in The Hanukkah Anthology. He writes that nun stood for nefesh (Hebrew for soul); gimmel stood for guf (body); shin stood for sechal (mind); and hey stood for hakol (all), implying all the characteristics of humankind. Among the most-sung Chanukah songs are those about the spinning top – dreidel, in Yiddish, and s’vivon, in Hebrew. Samuel Goldfarb is said to have penned the English lyrics, and Goldfarb, a Jewish liturgical composer employed by the Bureau of Jewish Education of New York between 1925 and 1929, wrote the melody for the English version. 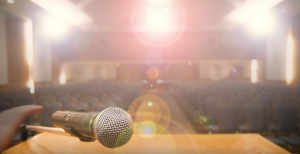 Goldfarb’s granddaughter, Susan Wolfe, recalls telling her public school class that her grandfather had written “The Dreidel Song,” but they did not believe her. As for dreidel games, here are the rules for three. On the sides of the dreidel are the four letters described above. To play the game, each player puts in one or more nuts or coins as agreed. A player spins the dreidel. If it falls on N, the player does nothing. If it falls on G, the player gets all. If it falls on H, the player takes half. If it falls on S, the player takes the whole pot. The next player takes their turn after each player once again contributes to the pot. All players spin the dreidel at a given signal. The player whose dreidel spins the longest is the winner. This game uses the fact that each Hebrew letter of the dreidel has a numerical value: N = 50, G = 3, H = 5 and S = 300. Players agree on a specific score to reach or time in which to play. Each player spins the dreidel. The scorekeeper credits each player with the numerical value of the letter on which his or her dreidel falls. The game continues until a player reaches the agreed-upon score or until the allotted time has passed, in which case the player with the most points wins.